When Easter rolls in and my husband preached that Sunday morning a message on “Why do you seek the Living among the dead?”, I sat straight up and listened hard and fought to take every word in. I wanted Easter to be all over me – a heart reality – a personal experience – a speaking voice, and not just a head knowledge. I long for Easter to infuse me – since this great and living hope we have in this life and the next really does hinge upon this one and only truth. I am honoured to have my husband’s words written all over this post, and spoken to my heart. When the women went with their spices to look for Jesus, they were going to a tomb to honour a dead man. They cared deeply for this man who had once claimed that He was God, but as far as they were concerned, He was no longer alive. His words had meaning – they represented his faultless ethics, his incredible intellect, and this love that they had never known before. But, as far as they were concerned, well, He was now dead, and his words were only, well, words… He wasn’t around any more to be able to guide them. They could remember him as one remembers a deceased loved one. Fondly, for He was someone that was no longer here among the living. I wonder if we sometimes approach God in a similar manner? We may even rush there “at early dawn”, but our expectation is that we are going to find a dead religion. We don’t really expect God to speak to us. We may think about the goodness of Him, in the past, and maybe even think about what He may do in the future, but there is no expectation that this Saviour, this God-man, exists in our space, is here, is with us, and is in fact, alive! Hence the angels pointedly asked “Why do you seek the living among the dead?”. The answer to this question may come from the previous verses at the end of chapter 23 when the women were observing Jesus’ dead body being wrapped up and placed in a tomb. They had seen with their eyes their beloved Teacher crucified in the most brutal way possible. If He could not save himself while He was alive, they reasoned, surely He had no power to do it while He was dead? 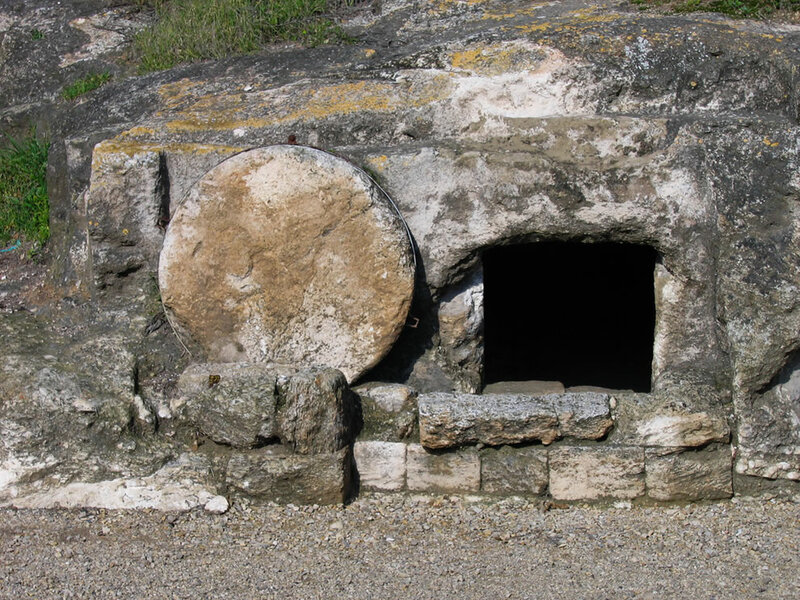 Yes, He may have raised Lazarus, but how can someone raise themselves from the dead, if in fact they are already dead? So they had given up. They could not understand how his previous words, “…. and on the third day rise” could possibly make any sense. How could a dead man raise himself? A dead man can’t even whisper a prayer, let alone make his heart beat again. It is unlikely that they had totally forgotten those words as quoted by the angels, but instead they had re-interpreted the words to match the dark reality of the moment. Do we also look at our world, our situation, our weaknesses and start to wonder if God really meant what He said to us? Did He really fill us with His Spirit which bears all that good fruit, love, joy, peace and so on, when we are feeling defeated by our frustration at life? Did He really mean “all these things shall be added unto you” after you have tried your best to seek God’s kingdom only to find yourself struggling to make ends meet? And so, when reality does not match the word of God, we end up with this “perplexed” (v4) condition. We have two competing, conflicting realities confronting our minds, and we become confused. Worst still, at times, God is actually in the middle of fulfilling his word in our lives as He was in the resurrection narrative, and yet we believers, struggle to believe. Jesus had said “the Son of Man must be delivered into the hands of sinful men”, and in fact that is what happened. A disciple who would may have believed that word wholeheartedly would have expected the rest of that prophecy to be fulfilled! Yet for some reason, the disciples could not accept the fact that He, God, would allow Himself to be that vulnerable. The plan of Salvation perhaps seemed illogical. How could you save anyone by being killed yourself? Perhaps the disciples underestimated how dire the spiritual state of the world really was. Perhaps they underestimated how humble and loving Jesus really was, to do whatever it took, to save their sinful, rebellious souls. Certainly there were a lot of things about Jesus’ death and resurrection that defied human logic and “decency”. Hence Paul called it “foolishness” to those who do not believe. Here God was fulfilling his Word, in His Way, and the disciples were quicker to accept death, than to hold onto to the words “and on the third day rise”. Is God doing something in our lives right now that seems to rather illogical and counter-intuitive, and yet if we are honest, is actually fulfilling God’s word in our lives? It is hard to resist the urge to re-interpret the word, and we are often more ready to accept defeat than to hold onto the rest of the promise. We are being transformed from glory to glory, but that process requires the death of self, and as that process is occurring, we begin to question if indeed God is part of this. He allows there to be circumstances completely out of control to bring us to a place of surrender, and how we resist. Yet if we die with Him, then we are raised with Him. The disciples seemed to have given up, or at least they sure made it look that way. They were nowhere to be found. There was not a single faith-filled statement by the disciples documented. They had conceded defeat to evil men, to darkness. They were now hiding – in an attempt to preserve themselves for fear of the Jews. Jesus had also seemingly surrendered to evil men, but behind this was his surrender to the Father’s will. He did not hide from evil and certainly made no effort towards self-preservation. He was silent for most of the cross-examination, and did not argue for His life. The difference was that Jesus knew what was going to happen next. He did not need to resist evil – He was going to demolish it by allowing Himself to be killed and then to rise from the dead. He knew the death He was succumbing to was to allow the sin of the world that He was carrying to die along with Him, and then He would rise, in a glorified form having defeated death and the grave! So what does it look like to worship a Living God, vs a dead God? 1 Don’t go to the grave. Well, for one thing, you don’t go to a tomb to worship a living God. A tomb is where you bury dead people. Tombs are where the past dwells, our past sins, other’s sins, past failures, past hatred, past pain. God has defeated our past sinful nature, and hence there is now no condemnation in Christ Jesus. We come to God knowing that our past is gone, and that He has a plan for our present life. We come in Hope, knowing that His Spirit has the power to change our lives and those around us. 2 Don’t look for a dead body. We don’t come to God with our offerings expecting Him to be a lifeless dead body. A dead body has no opinion, no thoughts, no arms, no power. We must approach God as He is. He is a living God who has ears to hear our prayers, a mouth to speak to us, and a mighty right hand to move in our lives. Interpret your reality through the lens of the Word of God. Whatever you are facing can be understood through God’s word. Pray for His Spirit to show you what is happening to you and how His word applies to your today.